Autism Spectrum Disorder: Evidence-Based Screening and Assessment is a 3-hour online continuing education (CE/CEU) course that summarizes evidence-based approaches to screening, assessing, and identifying ASD in children and young adults. Epidemiological studies indicate a progressively rising prevalence trend in the number of individuals identified with autism spectrum disorder (ASD) over the past decade. Yet, compared with general population estimates, children and youth with mild to moderate symptoms of ASD remain an underidentified and underserved population in our schools and communities. The DSM-5 conceptualizations of autism require professionals in clinical, school, and private practice settings to update their knowledge about the spectrum. In addition, professionals should be prepared to recognize the presence of risk factors and/or early warning signs of ASD and be familiar with screening and assessment tools in order to ensure that individuals with ASD are being identified and provided with the appropriate services. 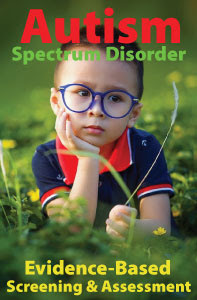 The objectives of this course are to (a) identify DSM-5 changes in the ASD diagnostic criteria; (b) distinguish between DSM diagnosis and IDEA classification schemes; (c) identify three levels of a multi-tier assessment strategy to screen for ASD; (d) name co-occurring conditions commonly found in ASD; (e) summarize the empirically-based screening and assessment methodology in ASD; and (f) describe a comprehensive developmental approach for assessing children, adolescents, and young adults on the autism spectrum. Course adapted with permission from Wilkinson, L. A. (2016). A Best Practice Guide to Assessment and Intervention for Autism Spectrum Disorder in Schools (2nd Edition). London & Philadelphia: Jessica Kingsley Publishers Ltd.
Lee A. Wilkinson, EdD, PhD, NCSP, is a licensed and nationally certified school psychologist, registered psychologist, and certified cognitive-behavioral therapist. Dr. Wilkinson is also a university educator and school psychology trainer. His research and professional writing has focused on behavioral consultation and therapy, and children and adults with autism spectrum disorders. He has published numerous journal articles on these topics both in the United States and internationally. Dr. Wilkinson is author of the award-winning books, A Best Practice Guide to Assessment and Intervention for Autism and Asperger Syndrome in Schools and Overcoming Anxiety and Depression on the Autism Spectrum: A Self-Help Guide Using CBT, both published by Jessica Kingsley Publishers. He is also editor of a best-selling text in the APA School Psychology Book Series, Autism Spectrum Disorder in Children and Adolescents: Evidence-Based Assessment and Intervention in Schools. His latest book is A Best Practice Guide to Assessment and Intervention for Autism Spectrum Disorder in Schools (2nd Edition).